Has this ever happened to you? You’re wandering around the Tatooine desert, minding your own business, when suddenly a Tusken Raider descends upon you, knocking you down and tearing your droid’s arm off. Oh, dear. Or maybe you’re a fast-talking smuggler with mounting unpaid debts, and the powerful crime boss you owe all those credits to has finally gotten fed up and put a bounty hunter on your tail. What do you do when you find yourself in over your head — and quite literally in carbonite, no less? 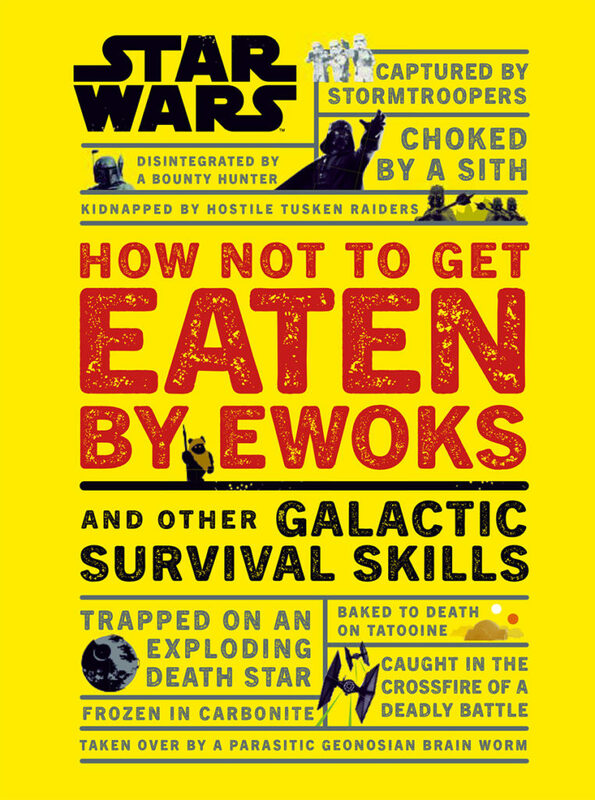 In his new book, How Not to Get Eaten by Ewoks (and Other Galactic Survival Skills), author Christian Blauvelt provides a tongue-in-cheek guide to staying alive in the Star Wars galaxy, with detailed lists of deadly predators to watch out for and helpful flow charts to get you out of pretty much any situation, including after you’ve been eaten. StarWars.com recently caught up with the author to get some helpful tips ahead of the book’s release this fall to help you navigate hostile landscapes, social minefields, and the occasional cape-wearing backstabber. StarWars.com: You seem like the person to ask: How can I avoid being eaten by an Ewok? Christian Blauvelt: Option one is to befriend one, of course! Just one Ewok probably won’t be able to eat you on his or her own, even though they’ll undoubtedly have some pretty impressive spear skills. 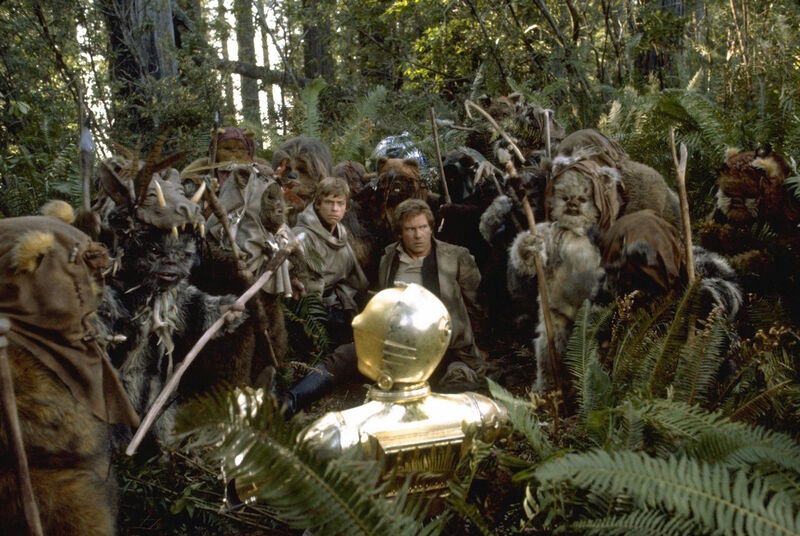 But if you get the Ewok on your side, you’ll have someone to advocate for you with the rest of the tribe. You should share a protein cracker with them, and show you’re willing to protect their nearby village by blasting any Imperial scout trooper that’s poking around nearby. Option two, and not everyone can afford this, is to have a protocol droid with plating the color of a precious metal. An Ewok shaman may find this fastidious etiquette expert to be some sort of god. But unless you have the Force and can make your droid perform a miracle, you’d best stick to option one. StarWars.com: You’ve written a few handy guides on mindfulness and assertive thinking (Be More Yoda and Be More Vader) as well as my favorite introductory guide to recommend to newbies, Star Wars Made Easy. What was different about your process in writing a guide for people in Star Wars versus life advice or real-world trivia for folks in this galaxy? Christian Blauvelt: I’ve been such a longtime fan of Star Wars, I feel like the saga is practically in my DNA – so in a way it was actually easier to adopt an in-world perspective for this book than, say, what I did with Star Wars Made Easy. That required me to look at Star Wars the way a new fan just taking their first step into this larger world would approach it. I had to wind back the clock 20 years and really think about the kind of questions I did ask as a new fan. StarWars.com: Star Wars is set in some naturally dangerous places and you address that in the book. 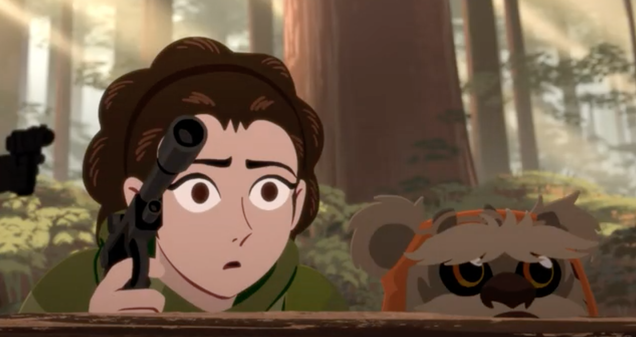 If the wildlife doesn’t get you, the bounty hunters will! How would you describe this book and everything you were trying to explore in it? 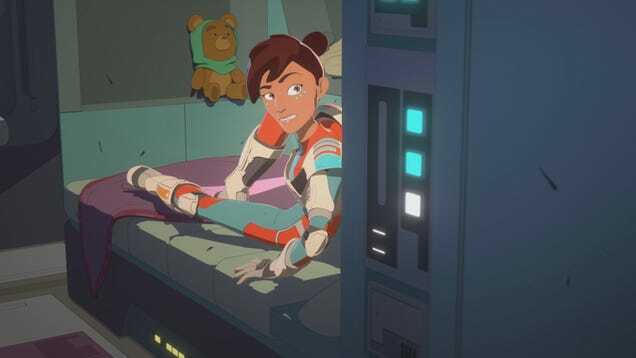 Christian Blauvelt: In part, it’s a survival guide that people in the galaxy far, far away would find useful to consult if they were suddenly stranded on a strange world following their ship crashing. What do you do next? How do you assess the wildlife, the terrain, what flora and fauna might work as a meal? How do you go about contacting the locals, if there are any? But it’s also a travel guide. Even if everything goes right – you don’t crash – you’ll still need to identify places and beings you might want to avoid, how to conduct negotiations and business transactions, how to spend a night on the town and dress appropriately, how to identify food that might prove poisonous to your species’ physiology, how to escape from prison if you find yourself unjustly incarcerated, how to gamble, and how to cheat. And, of course, how to keep your head down, survive, and even thrive in a galaxy that’s at war. 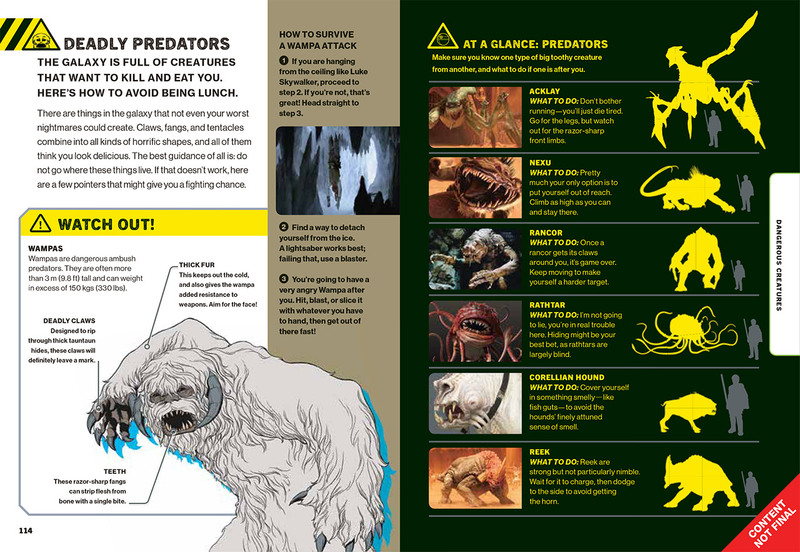 StarWars.com: What kind of in-world and real-world inspirations were you looking to as you described escaping from a wampa and other deadly predators that might mistake a human for a snack? Christian Blauvelt: One of the many, many reasons why Star Wars is so enduringly beloved is because, of all the fictional universes that exist, it’s the one that gives you the most complete sense of what it’s like to live there. To just be an ordinary person who wakes up, goes about his or her work, sells their goods or brings home some credits, relaxes at the local cantina, enjoys a good podrace. Just think: within 30 minutes of A New Hope you’re seeing an ordinary family sitting around a dining table and sharing a meal, blue milk included. You even get a glimpse of Uncle Owen and Aunt Beru’s kitchen! Those are lived-in details so precious you instantly suspend all disbelief. Everything more fantastical that happens after that – being attacked by a wampa or having an exogorth try to chomp down on your starship is that much more believable because of those early details of what it’s like to just be in a galaxy far, far away. I think it’s that feeling, of truly stepping into a larger world, that makes Star Wars absolutely singular in world building. The real-world travel guide who inspired me the most while writing is, one of my favorite people ever to grace U.S. television screens, Rick Steves. He’s endlessly open-minded and fair (much more so than the more safety and security-minded author I’ve channeled), but knows how not to be taken advantage of. And as a travel host, he has an amusingly dry, deadpan delivery – a very subtle, quirky sense of humor given life by a lot of detail, which is pretty much how I view the humorous sensibility of Star Wars. StarWars.com: In your opinion, what’s the most harrowing thing you could possibly encounter in the Star Wars galaxy? 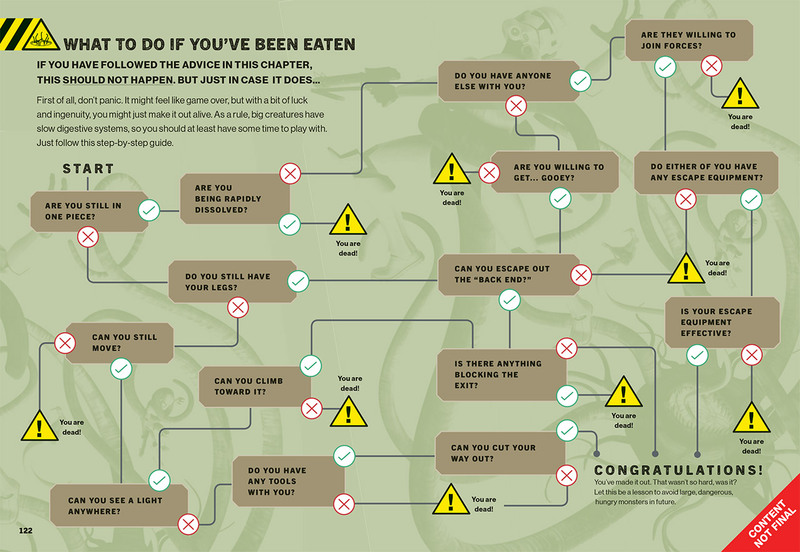 Christian Blauvelt: It’s gotta be being fed to the Sarlacc, right? What could be worse than finding a new definition of pain and suffering as you’re slowly digested for a thousand years? As we’ve seen, not even being inside a giant space worm is anywhere near as scary. And legend has it that Luke Skywalker even spent days or weeks at a time exploring the interior of a giant space slug following the Battle of Endor. So no, that’s not nearly as terrifying as being fed to a Sarlacc. StarWars.com: And there are some handy etiquette tips for navigating social minefields (as well as flying tips for navigating asteroid fields). Who would be your go-to Star Wars guru in-world to teach readers the rules of basic galactic etiquette? Christian Blauvelt: Poe Dameron, because of his incredible optimism and bravery, but also his ability to compartmentalize in a slightly cynical way. I keep thinking about how he tells Kaz in the first episode of Star Wars Resistance, right after they’ve both arrived at the Colossus, and Kaz is freaking out about seeing that guy being thrown over the edge: “Don’t think about it.” Why dwell on miserable things? Worry will never make anything better. And I’d really want to share that bit of advice with the absolute best etiquette expert the galaxy has to offer: C-3PO, of course. If I want to know the proper thing to wear for a night on the town, or the right greeting in the local language to try out, or the history of a ruin, or how to not unintentionally disrespect an adherent of a regional religion, I’d want to have C-3PO be that person. Er, droid. But as much as I’d want to have Poe and C-3PO be my guides, probably the person I’d need the most to survive in a galaxy far, far away would have to be DJ. If you’re on your own and out for yourself you could do a lot worse than the street smarts he could impart. StarWars.com: I hate sand. If I find myself stuck on Tatooine, what should I do? Christian Blauvelt: I choose to believe the long flowing robes locals wear are stick-resistant, so grains of sand just fall right off. But if you hate sand that much, start learning how to play a kloo horn so you can get a nice job as a musician at Chalmun’s Cantina someday, where it will be cool and sand-free. Figrin D’an and the Modal Nodes can’t be the house band forever, right?